"I love medicine, but I prefer to be behind the scenes of patient care. I like the testing in the lab. You have to know so much and relate it to the patient. Lab people are methodical and process-oriented. 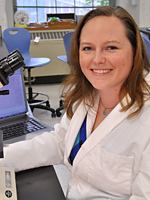 I want to be involved, doing the lab work that's significant to the treatment of patients." I still brag about the experience I received from Upstate and talk about the University, hospital staff, and faculty with praise. I had the experience of being both an undergraduate and graduate student at Upstate. 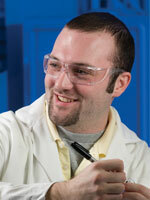 I was given the chance to pursue facets of laboratory science that I had never known. The chances to attend classes alongside doctoral students, both MD and PhD, and perform front line oncology research as part of a thesis paper was both rewarding and useful. I was given the opportunities to attend everything from grand rounds and journal presentations, to working alongside seasoned pathologists discussing complicated real-time cases. Throughout my career, the foundation of what the Upstate Master’s program has provided me becomes more and more apparent. The laboratories I have worked in have all been different from each other. Because of this Upstate foundation, I’ve moved from various roles including: education and quality assurance, laboratory inspection, reference lab, clinical lab supervision, and hospital safety boards. A master’s degree in medical technology gave me the confidence, knowledge and personal credentials to stand out on applications, and no matter where I moved, I was able to secure a leadership role and contribute. The mobility this degree has given me is valuable and has afforded me the ability to move where the needs of my family take me. I have the confidence I need to know I will succeed in any role. The combination of faculty and the large university network truly makes a difference. You see things that you may never see again, and dissect some of the most esoteric parts of modern laboratory study. It is with these experiences that the program truly shines and prepares you for the tremendous variance within the laboratory field. The more you see, the more useful you’ll be, and this program meets those criteria to a T.
My decision to go into the field of Medical Technology was made after researching types of jobs people had at a hospital (outside of being a doctor or a nurse). I wanted to help patients, but I wasn’t so sure about how my emotions would stand up to being directly involved with people who were ill. I wanted to do something with oncology, so the chances of me encountering sick people was unavoidable. I found Medical Technology and decided that career was the right fit for me; it’s hands on, it helps the patients, it helps the doctors and at the end of the day you make a difference whether you know it or not. I started out at a community college, and then transferred to Upstate for my junior and senior year where I made new friends and learned from a great group of supportive and knowledgeable professors. I chose to pursue an advanced degree because to be honest, I really liked the professors, and I wanted to specialize in molecular diagnostics and work for a cancer institute such as Roswell Park in Buffalo, NY. I currently work for their affiliate, OmniSeq, which was their molecular laboratory that branched off from the hospital. I was put in charge of the B-Cell Clonality Assay, which required updating. Writing my master’s thesis was beneficial to this project. I also perform testing for FLT3 and NPM1 mutations, as well as extract DNA and RNA by several methods. A T Cell Receptor assay and NGS (next-generation sequencing) are also a part of my work flow. My advice/ personal statement is to not settle. This is a job I’ve wanted since before I went to college, but I remain open to whatever opportunities come my way. Work hard, treat co-workers and others around you with respect, never stop asking questions, and that’s how you learn and grow only for the better.